Getting together 100 people on a cold winter’s night was a formidable task. Lindsay and her excellent team were up to it. 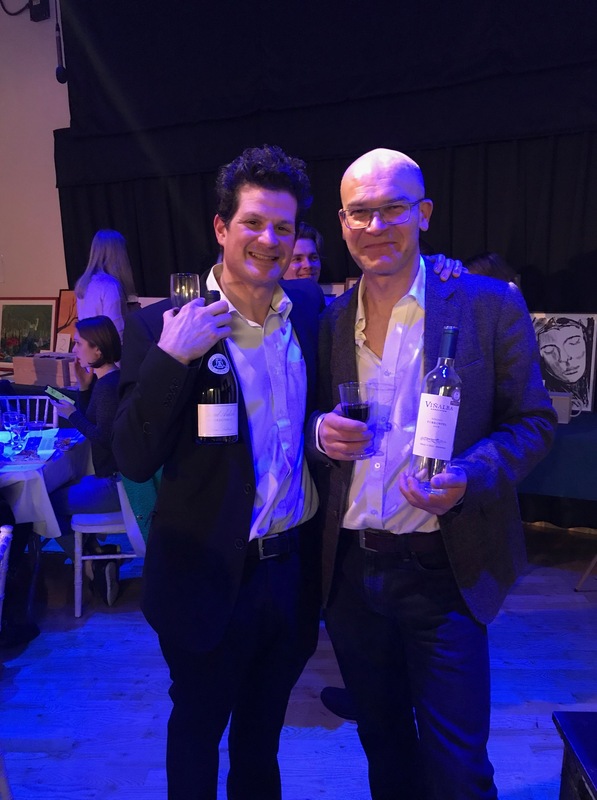 We hosted at the Village School Belsize Park, raising money for Friends of Della and Don in support of Ratmalana in Sri Lanka devastated by the 2004 Tsunami. We carefully selected wines to show of varietal qualities for the blind tasting quiz part of the evening and amended our wine quiz to compliment the evenings themes. It featured an art auction with a collection of fine work from artists such as Grayson Perry and delicious homemade Italian cuisine by Riccardo of TortelliniCup. We used the local Majestic Wine in Chalk Farm. The Torrontes exhibited great typicity with floral fragrant notes of lychee and white blossom. This was in stark contrast to the buttery rich Chardonnay from Louis Latour. The reds were similarly rewarding. To find a Pinot Noir of this quality from California for under a tenner was an achievement. The Edna Valley showed earthy qualities with a good red fruit core. Villa Borghetti’s Valpolicella Ripasso fermented on pomace from Amarone production displayed a richer wine with blueberry and spice aromas. The winning table was ‘Chardonnay’ who leapt up in joy and around £11,000 raised for Charity. Categories: Everything else, news, past events | Tags: wine quiz | Permalink. This was once an area predominantly known for growing Zinfandel with few wineries and not a well known area on the wine map. This has changed dramatically in the last twenty years with hundreds of new wineries. The town of Paso Robles benefits from the commerce with a range of organic restaurants, artisan wineries and my favourite hangout, the excellent Spearhead coffee company. An advantage of the area for viticulture is the considerable diurnal temperature variation which prolongs the growing season and helps the grapes develop physiological ripeness. Paso Robles AVA is 20 miles by 20 miles with areas as close as six miles or as far as forty from the ocean. The altitude also varies from 200 to 2,500 feet. There are now 11 sub AVA’s to reflect some of the differences. Robert Haas in combination with Perrin family from Chateau de Beaucastel started this venture in 1989. It took many years of quarantine by the US department of agriculture until cuttings taken from the Rhone were released virus free. They were pioneers of California’s Rhône movement and very much sparked the great interest and growth in this area. They follow dry farm, biodynamic, organic methods. Initially around 100 Acres the Estate is now 280 acres with a sheep and alpaca farm. We cycled from Paso Robles along Peachy Canyon road and reached elevations of their Vineyards between 1600 to 1900 feet. Cycling gave us the best sense of the geology as pieces of calcareous limestone rock were scattered on the sides of the roads. This is a new no expense spared winery and tasting room which boasts panoramic views of the area. They pride themselves on low intervention and have a spotless state of the art winery including gravity fed concrete fermenters. They have a multinational wine making team to bring the potential into reality. The wines are small production Rhone and Priorat style, powerful and concentrated and certainly have ageability and are showing their sense of place. Most of the wines are already allocated to their wine club members which we found to be common practice in general in California. Beautiful setting with a new winery and tasting room, solar powered sustainable agriculture low yield. We were looked after by the engaging Leanne and later fortuitously met Beatrice in her boutique shop in Paso Robles and we shared a nicely chilled bottle of her Estate Rose to celebrate Friday evening. Delicious though has a long way to go. A baby. Stephan’s wines are very much my style. Rich concentrated well balanced big wines with great ageing potential. Some of my favourite in California and I highly recommend arranging to visit if you’re in the area. There are now hundreds of wineries in Paso Robles AVA and it’s hard to choose where to visit. Venteux boutique winery with a lovely selection of wines making only a few hundred cases each dry farmed estate. The southern most AVA in Paso Robles. Santa Margarita AVA with fve different soil types, one of Paso’s coolest regions due to marine influence of the ocean. Kristin marketing director of ancient peaks gave us a wonderful tour of Santa Margarita ranch. They have 14,000 acres mostly a cattle ranch one of the oldest in California. First planted with vines in 1780 by Franciscan missionaries. In 2005 Ancient Peaks winery established. A wide array of grape varieties now grown. Our visit to Paso Robles was memorable. We were impressed by the wide variety of wines, terrain and climactic conditions. The locals warmly welcomed us. The town has everything you need to make it an ideal base. I would love to return for one of the special festival weekends. Categories: Everything else, travel, USA | Tags: california, paso robles | Permalink. Vines were first planted here in the 1700s by Spanish missionaries who travelled up from Mexico and set up missions along the Californian coast. Prohibition set things back and it took until the 1960s for grape growing to take hold. The Santa Maria valley produced the most grapes for the likes of Gallo. Santa Ynez valley remained more boutique and reached global attention after the blockbuster film ‘Sideways’ in 2004. We discovered on this tour many wineries have chosen to have their tasting rooms in towns such as Los Olivos, Buellton and Santa Barbara. Whilst this is clearly a good commercial and practical option for the individual business, it takes away the interest and romance of tasting on site and getting the full experience terroir and all. Established by the famed Jim Clenenden in 1982 Au Bon Climat (a well exposed vineyard) is renowned as one of the best producers of Pinot Noir and Chardonnay in California.They use sites from various areas of central coast including Bien Nacido Vineyards in Santa Maria and their own Au Bon Climat Vineyard in Santa Maria ValleyThe wines tasted had great purity and exposed typical Pinot Noir characteristics and also showed the variation in styles depending on site selection. From a site near Bien Nacido Vineyards in Santa Maria. My favourite of the tasting intense rich red fruits with an earthiness and spice long length. Classic Pinot with great balance that I’m sure will age for years if you can keep your hand off it. Isabelle Pinot Noir 2015 Composed of the best barrels of the vintage limited release dark rich complex beautiful balance and finish. Great wines, I’d like to take a case of this and Runway home! Founded by Doug Margerum restauranteur who worked with Jim Clenenden and Bob Linquist before starting up Margerum and now focuses more on Rhone varietals. Their winery is in Buellton 1 hours scenic drive on route 9 up the valley from Santa Barabara. We were lucky enough to arrive as the harvest was in full swing. Julia Weinberg gave us a fantastic tour of the busy winery including a traditional punching down caps of the grenache, smelling the yeasty, sulphurous, Carbon dioxide emitting from the open top fermenters and tasting fresh chilled Marsanne juice. We were lucky to meet the congenial Doug. They seemed to have an excellent team spirit and have a mandatory stop for lunch every day catered by their in house chef. Restraint white flower jasmine great balance and texture. Minerality. Cold soak free run 10% whole cluster. Co ferment of lots of parcels, Subtle blue fruits some spice Great concentration. Margerum wines were some of the most outstanding of my tour. It was the incredible balance of the wines. I feel Doug’s skills and prior intimate knowledge of the food and restaurant industry helps in the complex process of blending five grape varietals in the M5’s with superb results. The benefits of working cohesively as a team is invaluable. Bien Nacido Vineyards & Solomon Hills Estates – Santa Maria Valley. This visit was very kindly arranged at late notice by Master Sommelier Will Costello who works as the Estate Ambassador. He told me afterwards the only way to arrange the visit at this very busy winemaking time was to say we were interns who had come to help. They must have been disappointed when we arrived! We drove North East from Buellton to Santa Maria Valley and Bien Nacido Vineyards. It is one of the major viticultural nurseries, much of the Chardonnay in California came from BN cuttings. Fruit from Bien Nacido is used for Jim Clenendens and Bob Linquist wines. Assistant wine maker Anthony hosted us with a tasting table right in the middle of the working winery. Categories: california, Everything else, travel, USA | Permalink. Route 101 South from San Jose took us through the fertile plains of the Salinas Valley known locally as the ‘salad Bowl’ of California. We were greeted by fields of endless ripe orange pumpkins, lettuce in pristine rows and the sulphurous aroma of fields of brassicas. Then a turn South on the route 68 and we climbed into the Santa Lucia mountain range. Most of the tasting rooms are in the small town of Carmel Valley one of the eight sub AVAs of Monterey AVA. In the 1960s A.J Winkler and Maynard Amerine from UC Davis produced the Winkler scale, a classification system describing the climate of wine regions. It characterised Monterey County as comparable to Burgundy. Due to its proximity to the Pacific and Monterey Bay it is blessed with cool days throughout the growing season. From Sleepy Hollow Vineyard thirteen miles South of Monterey Bay, Santa Lucia Highlands AVA, Golden colour, very oaky nose, coconut, butter, some stone fruit, brioche butterscotch 90% new French oak barrels. Delicious but this one is for the full oak lovers. A vineyard site in SL Highlands closer to the ocean eight miles from Carmel Bay and more cool climate in character. Crisper more mineral and Burgundian some Meyer lemon notes, Crème brûlée finish. From a highly selected parcels of the Diamond T Vineyards deep honeyed colour Creamy buttery oaky. Cherry plum spice more spice than Sarah case crisp soft tannins. We dropped in to other tasting rooms and also liked some of the Pinot’s from Bernardus. The Wine House is a good place to go and relax in their gardens and have wines by the glass recommended by their sommelier they also have some interesting bin ends from around California. I was impressed with the Pinot’s which showed the high quality which can be obtained from the cooler areas of Central Coast such as Santa Lucia Highlands. The Chardonnays were perhaps over buttery and rich, but I still enjoyed them as the fruit still showed and the quality was obvious. For evening entertainment we headed to the old Cowboy bar ‘The Running Iron’. The locals were very welcoming and entertaining. Their 805 beer went down well with a six dice game called One Four Twenty Four introduced by Katy and Casey. When one of the regulars turned up with a version of Le Nez De Vin with forty aroma essences I was in my element! Categories: Everything else, travel, USA | Tags: california, cental coast, pinot noir | Permalink. This much overdue return to California with my longstanding Kiwi mates took us south of San Francisco. A decade earlier we had indulged in the well known excesses of Napa, Sonoma and Russian River. The plan this time was to explore the main Central Coast wine regions including Santa Cruz Mountains, Carmel Valley, Santa Barbara County and Paso Robles. What better place to start than Ridge Vineyards, Monte bello. In with the vines which produced the famous 1971 Ridge Monte Bello. Not far from the town of Santa Cruz over the Santa Cruz mountain range and overlooking Silicon Valley we arrived at the iconic Ridge Montebello Vineyards at 2,300 feet altitude. Dr Osea Perrone first planted vines here in 1885 but the vines were abandoned during prohibition. Famed for the Ridge Monte Bello 1971 which was one of the top wines at the famous 1976 ‘Judgement of Paris’ tasting organised by Stephen Spurrier. Since then they are known as producing some of the best wines in California. In a re run of the competition to mark it’s 40th anniversary in 2006, Ridge Monte Bello 1971 came top. Ridge also has an estate in Sonoma, Lytton springs. Very Burgundian in style nicely balanced with good acidity, malolactic with lees contact generating lovely texture and clear minerality. Delicious Chardonnay. Green pepper cool climate feel, restrained. Left bank Bordeaux style with some tertiary developments, would be hard to tell from a classed Bordeaux in a Blind tasting. The wines whet our appetites and we headed down the mountain to San Jose’s Western suburb of Cupertino to the impressive ‘Counter Burger’. Here you can tailor make your own burger. Highly recommend the Half pound Bison burger with gouda. It’s a Scenic drive along West Cliff road onto Route 1 from Santa Cruz followed by a climb up into the Ben Lomond mountains parallel to Santa Cruz Mountain range. Our oversized Cadillac SUV led us comfortably to the beautiful Beauregard Vineyards in the coastal redwood forests of Bonny Doon. This winery was Started in 1945 they possess 65 acres in this area on mainly sandy loamy soils. We took a leisurely stroll in their redwood forest and picnic gardens. Categories: california, travel, USA | Permalink. I’ve been fortunate to have visited many stunning wine regions, but there’s always been one I’ve been itching to explore.Since my father and I were celebrating big birthdays, it was ample excuse to finally visit the spectacular Douro valley with vineyards painstakingly carved out over centuries into the impossibly steep schist slopes. Our first stop was to the towering Graham’s Port Lodge in Vila Nova de Gaia, set on the banks of the River Douro. Part of the Symington family holdings, started by two Scottish brothers in 1820, from the wealthy textile family Graham’s. A magical place where for hundreds of years ‘rabelos’ traditional wooden Portuguese cargo boats have shipped people and goods up the valley to deliver the port barrels here where temperatures are favourable for slow maturation. This was a most perilous voyage and many lives were lost, as the river, now tamed by dams was full of ravaging torrents. Only a short 1.2 km ride from Ferrao train station we arrive at Quinta Nova winery hotel. It’s set in a truly stunning location with panoramic views up the river and miles of vineyard paths to explore. The winery on site Dates back to 1764.Their Conceitus Winery restaurant serves some of the best food in the valley. After a refreshing swim in the infinity pool we were ready for dinner with the winemakers selection at Conceitus. Intense color , aromas of wild berries, cassis and blueberries good concentration. The wines in general give a big bang for their buck, rich concentrated fruity but with depth and complexity. A Lagares full of red grapes awaited us.We excitedly immersed ourselves- wonderful, warm, fermenting, squishy sensations underfoot which led to some spontaneous albeit not very synchronized dancing! I highly recommend a trip to this region. It has everything an oenophile can wish for and more. Categories: Everything else, Portugal, travel | Tags: Douro valley, port, Portugal | Permalink. Categories: Everything else, past events | Tags: alsace, France | Permalink.